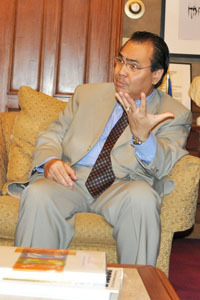 Consul-General Mario L. De Leon stresses a point during the interview for this article. Last year, Filipinos were the third largest nationality group that acquired U.S. citizenship and the fourth biggest that were issued legal permanent resident (LPR) status, or what is more popularly known as green card, in the United States. On the other end of the spectrum, however, Filipinos ranked fifth among nationalities with the most number of overstaying or undocumented immigrants. These statistics were culled from a series of studies released by the U.S. Department of Homeland Security’s Office of Immigration Statistics (OSI) earlier this year. The Department of Homeland Security placed the number of illegal-staying Filipinos at 280,000 as of 2010. “I don’t dispute that. Those are statistics from Homeland Security,” De Leon said in a recent interview. Mexico was the biggest source of undocumented immigrants, with more than 6.6 million, followed by Central American countries El Salvador, Guatemala and Honduras. “Puro Central or Latin American countries,” De Leon said referring to the top four countries ahead of the Philippines. The Philippines is the only country of origin of illegal immigrants in the top-five list where one would need to fly or sail to reach the U.S. mainland. De Leon attributed the continuing tendency of Filipinos to stay illegally in the U.S. to the Filipinos’ strong family ties. “In a way that encourages some to remain here even if they don’t have papers anymore,” he said. Through the years, the number of overstaying Filipinos in the U.S. has grown steadily. In 2000, there were an estimated 200,000 unauthorized Filipinos in the U.S. That population grew by 40 percent during a 10-year span. In 2009, there were 270,000 Filipino TNTs in the U.S. The OSI estimates that there are close to 10.8 million undocumented immigrants in the U.S. as of last year. Green card equals greener pasture? Also last year, a total of 93,000 Filipinos officially had their stay in the U.S. legalized, by acquiring either a green card or U.S. citizenship. A green card is issued to those granted lawful permanent residence in the U.S. An LPR enjoys almost the same rights as a US citizen, except for one – the right to vote. A green card also provides an immigrant a path to acquiring a U.S. citizenship. It is known informally as a green card because it had been green in color from 1946 until 1964. In May of last year, its color was changed back to green. However, there were less Filipinos who acquired U.S. citizenships last year compared to 2009, when a total of 38,934 Filipinos were naturalized. The 2010 figure represents a 9 percent drop from the previous year’s number. The 2010 figure represents a 3 percent drop from the 2009 figure. A total of 60,029 Filipinos got their green cards in 2009. Compounding the illegal Filipino immigrants’ problem is their refusal to go to Philippine authorities and seek help. De Leon said the Consulate provides consular services to all Filipinos regardless of immigration status. “We help them, as long as they come to us,” he said. The Philippine Consulate in New York has been conducting a “Know Your Rights” seminar in cooperation with a group of Filipino American lawyers. So far, the Consulate has done seminars in New York and Philadelphia. Earlier this year, the National Federation of Filipino American Associations (NaFFAA) said that based on the 2010 U.S. Population Census, there are now more than 2.5 million Filipinos in the U.S. This figure is 38 percent higher than the 1.8 million Pinoys counted in the 2000 Census. The U.S. conducts a population census every 10 years. The actual number of Filipinos in the U.S. is usually bigger than what appears on the U.S. Census. This is a result of the practice o Filipinos who are staying illegally in the U.S. to keep a low profile and avoid the Census.